The performance of investment grade credit during the opening quarter of the year was in stark contrast to the final quarter of 2018, as risk assets of all stripes performed well during the first quarter. The spread on the Bloomberg Barclays US Corporate Index finished the quarter 34 basis points tighter, after opening the year at a spread of 153 and closing the quarter at a spread of 119. The one-way spread performance of investment grade credit was so pronounced that at one point in the quarter there was a 22 trading day streak where the market failed to close wider from the previous day.i This was a remarkable feat considering that there were just 61 trading days during the quarter. The 10yr Treasury opened the year at 2.68% and closed as high as 2.79% on January 18th, but it finished the quarter substantially lower, at 2.41%. Tighter spreads and lower rates yielded strong performance for investment grade credit and the Bloomberg Barclays US Corporate Index posted a total return of +5.14%. This compares to CAM’s gross total return of +4.95% for the Investment Grade Strategy. When the Federal Reserve issued its December FOMC statement the consensus takeaway by the investor community was an expectation of two rate hikes in 2019 with one additional rate hike thereafter, in 2020 or 2021. In any case, the prevailing thought was that we were nearing the end of this tightening cycle with a conclusion to occur over the next two or three years. The Fed then took the market by surprise in late January, with language that was more conservative than expected as FOMC commentary signaled that they were less committed to raising the Federal Funds Rate in 2019. It was at this point that the market perception shifted – with most investors expecting just one rate hike in the latter half of 2019. The March FOMC statement was yet another eyeopener for Mr. Market, with language even more dovish than the decidedly dovish expectations. The consensus view is now murkier than ever. Some market prognosticators are pricing in rate cuts as soon as 2019; but the more conservative view is that barring a material pickup in global growth or domestic inflation we may not see another increase in the federal funds rate for 6-12 months, if at all in this cycle. It is entirely possible that the current tightening cycle has reached its conclusion and that lower rates could be here to stay. In the days following the March 20th FOMC release, the 10yr Treasury rallied sharply and there were two days during the week of March 25th where the 90-day Treasury bill closed with a slightly higher yield than the 10yr Treasury. This was the first time that this portion of the yield curve has been inverted since August of 2007. Note that this inversion was very brief in nature and as we go to print at the end of the day on April 1st, the 3m/10yr spread is no longer inverted and is now positive sloping at +17 basis points. That is not to say that this portion of the curve will not invert again, because Treasury rates and curves are dynamic in nature and ever changing. What Has Happened to Corporate Credit Curves? This is a common question in the conversations we have had with our investors in recent weeks. Corporate markets are entirely different from Treasury markets and behave much more rationally. The defining characteristic of corporate credit curves is that they nearly always have a positive slope. History shows that corporate credit curves typically steepen as Treasury curves get flatter. There are fleeting moments from time to time where corporate credit curves become slightly inverted but these instances are brief in nature and are quickly erased as market participants are quick to take advantage of these opportunities. For example, there may be a motivated seller of Apple 2026 bonds at a level that offers slightly more yield than Apple 2027 bonds. This has nothing to do with dislocation in the Apple credit curve and everything to do with the fact that there is an extremely motivated seller of the bond that is slightly shorter in maturity. Once that seller moves their position, the curve will return to normalcy and you could once again expect to obtain more yield for the purchase of the 2027 bond than you would for the 2026 bond. 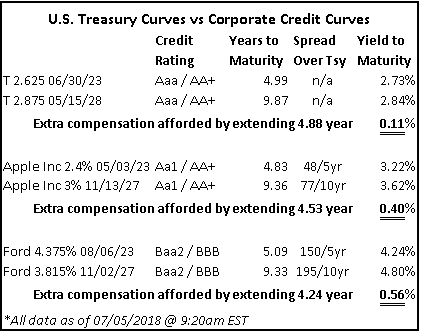 The following graphic illustrates current 5/10yr corporate credit curves for two widely traded investment grade companies, one A-rated and one BBB-rated. As you can see, corporate credit curves are much steeper than the spread between the 5 and 10yr Treasury. The takeaway from this exercise is that investors will always be afforded extra compensation by extending out the corporate credit curve. At Cincinnati Asset Management, one of the key tenets of our Investment Grade Strategy is that we believe that it is nearly impossible to accurately predict the direction of interest rates over long time horizons. However, throughout economic cycles, we have observed that the 5/10 portion of the curve is usually the sweet spot for investors. Consequently, the vast majority of our client portfolios are positioned from 5 to 10 years to maturity. We will occasionally hold some positions that are shorter than 5 years but we almost never purchase securities longer than 10 years. Further, while an investor can earn more compensation for credit risk by extending out to 30yrs, more often than not this strategy entails excessive duration risk relative to the compensation afforded at the 10yr portion of the curve. Our strategy allows us to mitigate interest rate risk through our intermediate positioning and allows us to focus on managing credit risk through close study and fundamental analysis of the individual companies that populate our portfolios. Where in the World is the Yield? The growth in negative yielding debt has, in some cases prompted foreign investors to pile into the U.S. corporate debt market. A measure of overseas buying in 2019 has more than doubled from a year earlier according to Bank of America Corp.iii Japanese institutions are among the biggest of the foreign investors and the Japanese fiscal year started on April 1, which could lead to even more buying interest in U.S. corporates according to Bank of America. According to data compiled by the Federal Reserve as of the end of 2018, Non-U.S. investors held 28% of outstanding U.S. IG corporate bonds.iv What does this all mean for the U.S. corporate bond market? First, it is safe to assume that foreign demand certainly played a role in the spread tightening that the investment grade credit markets have experienced year to date. Second, although U.S. rates may seem low, when viewed through the lens of global markets, they are actually quite attractive on a relative basis. As long as these relationships exist then there will be continued foreign interest in the U.S. credit markets. Although our Investment Grade Strategy trailed the index in the first quarter, we are pleased with the conservative positioning of our portfolio. The modest underperformance can largely be explained by our significant underweight in lower quality BBB-rated credit relative to the index. We do not have a crystal ball, but are reasonably confident that we are in the later stages of the credit cycle so we continue to place vigilance at the forefront when it comes to risk management. Please know that we take the responsibility of managing your money very seriously and we thank you for your continued interest and support. The final quarter of 2018 was extremely volatile, and no asset class was spared, whether it was corporate credit, Treasuries, commodities or equities. The spread on the corporate index finished the quarter a whopping 47 basis points wider, having opened the quarter at 106 before finishing at 153, the widest level of 2018. Treasury bonds were one of the few positive performing asset classes during the fourth quarter as the 10-year Treasury started the quarter at 3.06%, before finishing the year substantially lower, at 2.69%. The 10-year began 2018 at 2.41%, and it rose as high as 3.24% on November 8, before dropping 58 basis points during the last 8 weeks of the year. On the commodity front, West Texas Crude peaked at $76.41 on October 3, before it endured an elevator-like collapse to $45.41, a 40% move in less than a full quarter. Equities also suffered in the final quarter of 2018. The S&P500 was flirting with year-to-date highs at the beginning of the fourth quarter before losing more than 13.5% of its value in the last quarter of the year. All told, the S&P500 finished the year in the red, with a total return of -4.4%. 2018 was the worst year for corporate credit since 2008, when the corporate index returned -4.94%. For the fourth quarter, the Bloomberg Barclays Corporate Index posted a total return of -0.18%. This compares to CAM’s quarterly gross total return of +0.71%. For the full year 2018, the corporate index total return was -2.51% while CAM’s gross return was -1.44%. CAM outperformed the corporate index for the full year due in part to our cautious stance toward BBB-rated credit and due to our duration, which is shorter relative to the index. 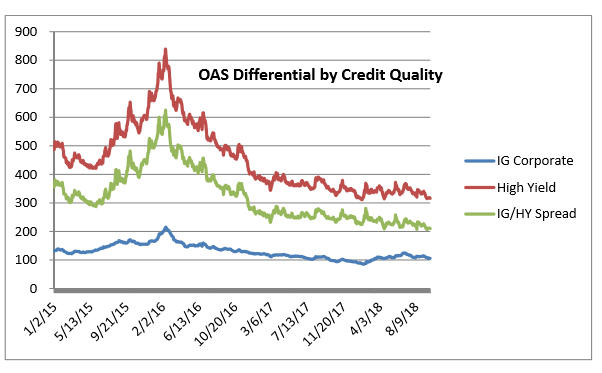 BBB-rated credit underperformed A-rated credit in 2018. In late January and early February, the spread between the A-rated portion of the index and the BBB portion was just 43 basis points, but that spread continued to widen throughout the year and especially late in the year. The spread between A-rated and BBB-rated finished the year at 79 basis points as lower rated credit performed especially bad on a relative basis amidst the heightened volatility of year end. We have written much about the growth in BBB credit and our structural underweight relative to the index. CAM seeks to cap its exposure to BBB-rated credit at 30% while the index was 51.21% BBB at year end 2018. Our underweight is born out of the fact that we are looking to 1.) Position the portfolio in a more conservative manner that targets a high credit quality with at least an A3/A- rating and 2.) While it is our long-established style to position the portfolio conservatively, we do not believe there are currently enough attractive opportunities within the BBB universe that would even warrant a consideration for increased exposure to BBB credit. The BBB growth storyline has received tremendous focus from the mainstream financial press in recent months. Hardly a day goes by without multiple stories or quips from market commentators. Some have gone as far as to predict that the growth in lower quality investment grade bonds will “trigger the next financial crisis”i or that it is akin to “subprime mortgages in 2007.”ii While we at CAM are extremely cautious with regard to lower quality credit, these statements and headlines are hyperbole in our view. We welcome the increased attention on the bond market from the financial press as we often feel like our market is ignored despite the fact that the total value of outstanding bonds in the U.S. at the end of 2017 was $37.1 trillion while the U.S. domestic equity market capitalization was smaller, at $32.1 trillion. iii What the press and pundits are missing is that, if BBB credit truly hits the skids, it has the potential to be far more damaging to equity holders than it does to bondholders. A few of the reasons an investor may own investment grade corporate bonds as part of their overall asset allocation are for preservation of capital, income generation and most importantly, for diversification away from riskier assets, primarily equities. High quality investment grade corporate bonds are meant to be the ballast of a portfolio. Bondholders are ahead of equity holders and get paid first in the capital structure waterfall. Many BBB-rated companies pay dividends or spend some of their cash flow from operations on share repurchases. Equity holders of these companies should be aware that dividends and share buybacks are levers that can be pulled if necessary in order to pay off debt that the company borrowed from bond holders. To that end, the following chart shows the 10 largest BBB-rated corporate bond issuers in The Bloomberg Barclays U.S. Corporate Index. We calculated how much each of these companies has spent on dividends and share repurchases during the last 12 months through 09/30/2018. If any of these companies were to endure financial stress (and some already are under stress) then we would expect that the majority, if not all of the funds that were previously allocated to dividends and share repurchases would instead be diverted to debt repayment. CAM currently has exposure to just three of these ten largest BBB issuers. As an active manager that is not beholden to an index, CAM can pick and choose which credits it adds to its portfolio based on risk/reward and valuation relative to credit metrics. •Anheuser-Busch InBev reported disappointing third quarter results that showed a lack of progress in deleveraging the balance sheet stemming from its 2016 acquisition of SAB Miller. In conjunction with its lackluster earnings print, management slashed the dividend by 50% in order to divert more funds toward debt repayment. Anheuser-Busch InBev stock traded off sharply on the news and the stock posted a price change of -38.04% in 2018. Comparatively, one of the most actively traded bonds in the capital structure, ABIBB 3.65% 02/01/2026, posted a total return of -4.74% in 2018, per Bloomberg. • CVS was once a prolific buyer of its own shares. The company bought back an average of $4bln per year of its own shares over the five year period from 2013-2017, but it did not buy back any shares in 2018. That is because CVS closed on the acquisition of Aetna in 2018, which required it to bring a $40 billion dollar bond deal in March; the largest deal of 2018 and the third largest bond deal of all time. In order to provide an incentive for bondholders to purchase its new debt offering, CVS had to promise that it would divert free cash flow to debt repayment in lieu of share repurchases. Although CVS stock underperformed the S&P500 by more than 3% in 2018, this example is not one of a company that is undergoing stress but a very typical example of a company which undergoes transformational M&A and pauses shareholder rewards in order to repair the balance sheet. Bondholders would have demanded much more compensation from CVS’s new debt deal if it did not halt its share buybacks. • General Electric’s issues are well publicized and yet another example of cash being diverted toward debt repayment. First, the company slashed its dividend by 50% in November 2017, moving it from $0.24 to $0.12 per share. The second cut came in October 2018, as GE all but eliminated the dividend, moving it to a mere penny per share. GE intermediate bonds, specifically the GE 4.65% 10/17/2021, were performing extremely poorly until mid-November but then they rebounded in price on news of GE’s commitment to debt repayment. The bonds ended the year with a total return of -2.34% per Bloomberg, but this pales in comparison to the performance of GE equity, which finished the year down -56.62%. The purpose of these examples is not to make the case for bonds over stocks, but to illustrate that BBB-rated companies have levers to pull in order to assist in the repayment of debt. In times of stress, shareholder rewards are typically the first things to go so that cash flow can then be diverted to balance sheet repair. At CAM we feel that an actively managed bond portfolio that picks and chooses BBB credit in a prudent manner can navigate potential landmines in lower quality credit and can selectively choose BBB-rated issues which can aid in outperformance. As we look toward 2019, we expect continued volatility, especially in lower quality credit, but we think that our portfolio is well positioned due to its high quality bias. Two of our top macroeconomic concerns are Fed policy and the continued economic impact of global trade wars. As far as the Federal Reserve is concerned, it just completed the fourth rate hike of 2018 and the 9th of this tightening cycle. FOMC projections were updated at the December meeting and now show two rate hikes in 2019 and one more after that in 2020 or 2021. This suggests that we are nearing the end of this tightening cycle. What concerns us is that European and Chinese growth are both slowing, and if the U.S. economy slows as well we could see a situation where we have a domestic U.S. economy that is not supportive of further hikes. In other words, there is a risk that the Fed goes too far in its quest to tighten, bringing about a recession, which is negative for risk assets. Corporate bonds in general are more attractive today than their recent historical averages. The spread on the corporate index finished the year at 153, while the three and five year averages were 124 and 125 respectively. Going back to 1988, which was index inception, the average spread on the index was 133. New issue supply could play an outsized role in the spread performance of corporates in 2019. 2018 new issue supply was down 10.7% from 2017 and most investment banks are calling for a further decrease of 5-10% in new issue volume in 2019.iv If this decrease in issuance comes to fruition but is coincident with good demand for IG credit then we could find ourselves in a situation where there is not enough new issue supply to satiate credit investors, which would make for an environment that is very supportive of spreads. In what seems to be a recurring theme in our commentaries, caution will continue to rule day for our portfolio as we head into 2019. We will continue to prudently manage risk within our portfolios and strive for outperformance but not at the sake of taking undue chances by reaching for yield. We wish you a happy and prosperous new year and we thank you for your business and continued interest. This information is intended solely to report on investment strategies identified by Cincinnati Asset Management. Opinions and estimates offered constitute our judgment and are subject to change without notice, as are statements of financial market trends, which are based on current market conditions. This material is not intended as an offer or solicitation to buy, hold or sell any financial instrument. Fixed income securities may be sensitive to prevailing interest rates. When rates rise the value generally declines. Past performance is not a guarantee of future results. Gross of advisory fee performance does not reflect the deduction of investment advisory fees. Our advisory fees are disclosed in Form ADV Part 2A. Accounts managed through brokerage firm programs usually will include additional fees. Returns are calculated monthly in U.S. dollars and include reinvestment of dividends and interest. The index is unmanaged and does not take into account fees, expenses, and transaction costs. It is shown for comparative purposes and is based on information generally available to the public from sources believed to be reliable. No representation is made to its accuracy or completeness. ii DiMartino, Danielle (DiMartinoBooth). “A lot of BBB is toxic. I am watching this more closely than anything. You must put “investment grade” in quotes. This is the sector that has grown to be a $3 trillion monster. Where’s the parallel? Subprime mortgages circa 2007.” November 29, 2018, 9:00 AM. Tweet. The theme of the third quarter was tighter spreads and higher rates. 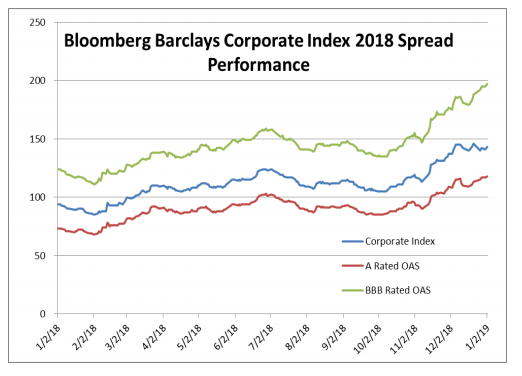 The spread on the Bloomberg Barclays US Corporate Index started the quarter at a year-to-date high of 124, at which point spreads began to march tighter, with the index finishing the quarter at an OAS of 106. The 10yr Treasury started the quarter at 2.86% before finishing at 3.06%. All told, movements in spreads and rates were nearly a wash, as the 18 basis point tightening of the index was not quite enough to offset a 20 basis point rise in the 10yr Treasury. It was a “coupon-like” type of return for corporate bonds during the quarter as the US Corporate Index posted a positive quarterly total return of +0.97%. This compares to CAM’s gross quarterly return of +0.84%. Through the first 9 months of the year, the US Corporate Index has posted a -2.33% total return, while CAM’s gross total return was -2.13%. There was a flight to quality in the second quarter that was beneficial to CAM, but that trend reversed in the third quarter. Recall that CAM limits itself to a 30% weighting in BBB-rated credit, which is the lower tier of credit quality within the US Corporate Index, while the index itself had a 49.13% weighting in BBB-rated credit at the end of the third quarter. The BBB-rated portion of the index saw its spread tighten 22 basis points during the quarter, which was 5 basis points better than the 17 basis points of tightening that the A-rated portion of the index experienced. Because CAM targets a 70% weighting in higher quality credit, the gross performance of CAM’s portfolio trailed the index by 0.13% during the quarter. We at CAM are perfectly comfortable, even enthused, by our underweight in lower quality credit. CAM was founded in 1989, so we have seen each of the last three credit cycle downturns that have occurred in the past 30 years. We do not know when the current cycle will turn but we do know that we are 10+ years into the expansion period, and we also know that it is inevitable that the cycle will turn at some point. Most of all, we are not currently seeing enough value in the lower tier of investment grade rated credit. As a bottom up manager that is focused on fundamental research, we are currently finding enough good ideas to populate portfolios, but certainly not enough good ideas to approximate the 50% index weighting in BBB-rated credit. We intend to continue to keep our structural underweight on the riskier portions of the investment grade rated universe and we expect that by doing so that our client portfolios will experience lower volatility and higher returns over the long term. Yields in the riskiest portions of the corporate bond market may not be currently providing enough compensation for investors (see chart below). On September 19th 2018, the spread between the US Corporate Index and US High Yield Index reached a multi-year low of 207 basis points. This means investors were being compensated just an extra 2.07% to own high yield bonds versus investment grade bonds. This differential finished the quarter at 2.10%, not far off the lows. To put this into perspective, the premium afforded by high yield bonds was as high as 6.25% as recently as February 11, 2016. September 2018 marks the lowest spread between high yield and investment grade since July of 2007, which was just prior to the 2007-2008 credit cycle downturn. Again, we feel like there are certainly some risks worth taking in credit, but there are not so many good investments available that the riskiest portions of the corporate bond universe should be trading at near historical lows relative to the much less riskier portions. The Federal Reserve raised the Fed Funds Target Rate at its September meeting. This marks the 8th increase in the target since the current tightening cycle began in December of 2015. The current implied probability of a Fed rate hike at the December 2018 meeting is 70.1%i. Fed policymaker forecasts envision short term rates at 3.1% by the end of 2019 which implies a hike in December of this year and two additional hikes throughout 2019ii. In our second quarter commentary, we wrote extensively about the flattening of the Treasury curve relative to the steepness of the corporate credit curve. Our positioning has not changed, and we intend to continue to position the portfolio in intermediate maturities that mature within 5-10 years. We believe that, over the medium and longer term, investors are most appropriately compensated for credit risk and interest rate risk by investing in intermediate maturities and that is largely due to the historically reliable steepness of the corporate credit curve. We are also firm in our belief that investors should spend time focusing on risks that can be managed, like credit risk, and spend far less time trying to tactically reallocate their portfolios in response to risks that are fraught with unpredictability, like interest rate risk. policy? We are in the midst of the longest economic expansion on record – just how long can it continue? We believe that there are plenty of opportunities in investment grade credit, but that now is the time for prudent risk taking and preservation of capital, which are cornerstones of our strategy. Although investment grade credit has seen negative returns for the first 9 months of the year, we support the thesis that the asset class can be part of the bedrock in the framework of an overall asset allocation and can offer attractive risk adjusted returns over medium and longer term time horizons. As the saying goes, “failing to prepare is preparing to fail”, and now is a time for de-risking bond portfolios instead of being unduly concerned with missing out on upside. The second quarter of 2018 brought wider spreads and higher rates, which weighed on the performance of investment grade corporate credit. The Bloomberg Barclays US Corporate Index opened the quarter at a spread of 109 basis points over Treasuries and it finished the quarter at a spread of 123. Like spreads, Treasury rates were also higher on the quarter, as the 10yr Treasury rose as high as 3.11% on May 17th, before it finished the quarter at 2.86%, which was 0.12% higher than where it opened the quarter. Wider (higher) credit spreads and higher rates both have a negative impact on bond prices, which sometimes cannot fully be offset by the coupon income that is earned from a diversified corporate bond portfolio. The US Corporate Index posted a total return on the quarter of -0.98%. This compares to CAM’s gross return during the second quarter of -0.45%. Looking at YTD numbers, the corporate index posted a total return of -3.27% through the first 6 months of the year while CAM’s gross return was -2.94%. CAM outperformed the index during the quarter due in part to the fact that CAM’s portfolio is always positioned in intermediate maturities that generally range from 5 to 10 years. Treasury rates have moved higher thus far in 2018, and the index has a longer duration than CAM’s portfolio, so interest rates are more of a headwind for the corporate index relative to the intermediate positioning of CAM’s portfolio. Additionally, CAM has benefitted from the higher credit quality of its portfolio relative to the Corporate Index. CAM targets a weighting of 30% for its allocation to BBB-rated corporate credit, which is the riskier portion of the investment grade universe, while the index has a weighting of nearly 50% in BBB-rated credit. Credit spreads finished the quarter near the widest levels of the year. The tightest level for spreads in 2018 was on Friday, February 2nd. Since that time, there has been significant dispersion in the performance of lower rated credit versus higher rated credit. From February 2nd until the end of the quarter on June 29th, the Corporate Bond Index was 38 basis points wider. During this same time period, single-A rated credit outperformed the index as a whole, as this higher quality portion of the index was 33 basis points wider while the BBB-rated portion of the index was a significant underperformer as it widened by 46 basis points. In other words, since the market low on February 2nd, A-rated credit spreads have outperformed BBB-rated credit spreads by 13 basis points. It is too early to tell if this quality performance dispersion is the making of a trend, but we at CAM are comfortable with our significant underweight to the riskier BBB-rated portion of the index, as we are not seeing enough value in riskier credit currently and believe that the balance between risk and reward is better served by staying overweight higher quality A-rated credit. The Federal Reserve raised the Fed Funds Target Rate at its June meeting. This marks the 7th increase in the target since the current tightening cycle began in December of 2015. Our clients often ask us what we are doing in response to the Fed’s tightening cycle, which may call for an additional 1-2 rate hikes this year and as many as 3 in 2019. Our response is that we will continue to position the portfolio in intermediate maturities that range from 5-10 years until maturity. Generally speaking, we will allow bonds to roll down the curve until somewhere around the 5-year mark at which time it is often beneficial to sell that 5-year maturity and redeploy the proceeds into a more attractive opportunity that matures in 7-10 years. This cycle tends to repeat itself time and time again. We believe that the intermediate portion of the yield curve is the spot where investors are most appropriately compensated for credit risk and interest rate risk. An investor can earn a higher yield by investing in bonds that mature in 20 or 30 years but the extra compensation afforded for credit risk beyond 10 years is generally benign and an investor would also be taking on much more interest rate risk beyond 10 years. Rather than trying to “guess” the next move in interest rates, we position the portfolio in a predictable maturity band and focus our efforts on analyzing the prospects of individual companies that populate our portfolio. Much has been written and reported in the financial press with regard to the flattening of the yield curve. The Fed Funds Target Rate has a significant impact on Treasury rates in the 2-5 year range whereas the 7-10 year band of Treasury rates is more dependent on GDP and inflation expectations. The first target rate hike of the current cycle occurred in December of 2015. Since that time and until the end of the second quarter of 2018, the 2-year Treasury has moved 150 basis points higher and the 5-year has gone 100 basis points higher while the 10-year moved just 60 basis points higher. At the end of the second quarter, the 5/10 Treasury curve was 13 basis points, meaning the 10-year Treasury yield was only 13 basis points higher than the 5-year Treasury yield. The 10/30 Treasury curve was just as flat, at 13 basis points. Think of it this way, if you were to invest in a 30-year Treasury instead of a 10-year Treasury, you would only be earning 0.13% more; this hardly seems like very good compensation for a Treasury investor taking on an additional 20 years of maturity. We at CAM are corporate bond investors so it is important to note that, although corporate bonds trade at a spread over Treasuries, the corporate bonds themselves also have credit curves. Corporate bond curves tend to behave more rationally than Treasury curves and investors are typically more fairly compensated for taking on additional years of maturity. Corporate bond curves are organic in nature and ever changing. Higher quality A-rated corporate credits tend to have flatter curves whereas BBB-rated credits will have steeper curves. In the below example, you can see that the investor who extends in Apple or Ford credit receives 40 and 56 basis points of compensation respectively, while the Treasury investor receives only 11 basis points of compensation. As we turn to the second half the year, we at CAM remain as cautious as ever. The U.S. economic expansion has entered its 10th year, but we must remember that this is a global economy. While the global economy seems relatively good, growth has been low, and it would not take much to create a recessionary environment where risk assets could fare poorly. There are a number of risks that could impair global growth, most especially a trade conflict that has the potential to erupt into a global trade war. We continue to be selective in our investments, focusing on higher quality credits with sustainable competitive advantages that will allow them to thrive in a variety of economic environments. We are also favoring companies with management teams that have shown financial discipline during a prolonged low interest rate environment, as many management teams have been tempted by low borrowing costs and have piled debt on their balance sheets that could force them to refinance in an environment where borrowing costs are higher. In short, we will continue to add value for our clients by focusing on credit work and populating the portfolio with our best ideas within the realm of corporate credit. The first quarter of 2018 saw credit spread volatility for the first time since early 2016. The Bloomberg Barclays US Investment Grade Corporate Bond Index started the year at a spread of 93 basis points over treasuries and narrowed to 85 on February 2nd which was the tightest level since 2007. From mid‐February onward, spreads finished the quarter wider, increasing to a spread of 109 basis points over treasuries. Recall that, if Treasury rates are held constant, tighter spreads mean bonds have increased in value while wider spreads mean those valuations have decreased. Treasury rates also impacted the performance of corporate bonds in the quarter. The 10yr Treasury started the year at 2.41% and closed as high as 2.95% on February 21st, before it finished the quarter at 2.74%. The combination of credit spreads that were 16 basis points wider and a 33 basis point increase in the 10yr Treasury was too great of a headwind for corporate credit during the quarter, and as a result the Bloomberg Barclays IG Corporate Index posted a negative return of ‐2.32%. This compares to CAM’s gross total return of ‐ 2.50%. By design, relative to the index, CAM is overweight higher quality credit (A‐rated) and underweight lower quality credit (BBB‐rated). Even though the index posted negative returns for the first quarter of 2018, the lower quality portions of the index outperformed the higher quality portions, a trend that has persisted since 2017. As we have stated in previous commentaries, we expect that, over the longer term, this trend will reverse, and those investors who have favored higher quality and avoided the temptation of “reaching for yield” will be rewarded with outperformance over a longer time horizon. discussing these rate moves. The duration of The Investment Grade Corporate Bond Index at the end of March was 7.56. What this means is that, all else being equal, a 100 basis point increase in interest rates would yield a 7.56% drop in the value of a bond portfolio. So, a 50 basis point increase, all else being equal, would yield a 3.78% drop in the value of a bond portfolio. Conversely, a decrease in Treasury rates would increase the value of your bond portfolio. Now, rarely in the real world, do all other things remain equal, but the power of duration was the main driver of poor returns for corporate bonds during the quarter. At Cincinnati Asset Management, our view on interest rates is that of an agnostic. We consistently position the portfolio in intermediate maturities that are 5 to 10yrs from maturity. Over the medium and longer term time horizons we have observed that this is the ideal place from the standpoint of maximizing the steepness of both the yield curve and the corporate credit curve. A key point to note regarding duration is that it decreases over time. With each passing day, a bond gets closer to its final maturity date, and the bond valuation gets closer to its par value as it approaches maturity – after all, a bond is a contractual agreement where the company that issued the bond has agreed to make a series of semiannual coupon payments to the holder over a specified period of time and it has also agreed to return the par value of the bond at maturity. The 9yr bond that was purchased in your account yesterday will be an 8.5 year bond in 6 months. Someday, it will be a 5yr bond, at which point it likely makes sense to extend from 5yrs back to somewhere in the 7‐10yr portion of the curve, depending on what offers the most attractive valuation at that point in time. We at CAM are extremely confident that we cannot predict where rates will go next. We only know that they will go higher, lower or stay the same. Now, to be sure, we will always select the shortest maturity in that 5‐10yr range that maximizes valuation along the Treasury curve. We have been finding quite a bit of value in 8‐9 year bonds so far in 2018 whereas there are other points in time where 10yr or 7yr bonds make more sense. Where we add the most value for our clients is in the assessment and ongoing monitoring of credit risk. Rates are going to do what they are going to do, but the credit risk associated with individual companies can be studied, researched and managed. When you invest your money with CAM, you are not buying an unmanaged, passive index. Our goal is to populate each client portfolio with the bonds of individual companies that offer the most compelling risk reward at that particular point in time. As we turn to the second quarter we are seeing what we believe are reasonably compelling valuations in corporate credit. Higher underlying Treasury rates coincident with somewhat wider spreads have served to create some attractive entry points into defensive credits. Some of these same defensive credits were trading at unattractive valuations just a few short months ago when spreads were tighter and rates were lower. We are also finding value in the financial sector, as those valuations are compelling relative to the industrial sector and the economy is set up well for banks and non‐bank financials to report healthy earnings growth which in turn leads to stable and/or improving balance sheets for financial companies. New issue supply in the market is down 11.3% from 2017i but new issue concessions have risen to an average of 11.5bps which is the highest level in over 2 yearsii. A “new issue concession” is the compensation provided to a buyer of a newly issued corporate bond. For example, if a company has a 10yr bond outstanding with a yield of 4%, and it wants to issue a new 10yr bond to finance a plant expansion, then it will have to provide a concession to investors in the form of extra compensation to incentivize investors to purchase the new bond in the primary market instead of the existing bond in the secondary market. If we take the average concession of 11.5bps then the new bond would have a coupon of 4.115% which would make it attractive relative to the existing bond with a coupon of just 4%. Our access to the institutional primary market is one of the ways which we provide value to our client accounts. During the 1st quarter of 2018, about 25% of our purchase volume was new issuance. This is despite the fact that we did not find a single attractive new issue to purchase during the entire month of March. In other words, we remain even more selective than usual when it comes to primary market opportunities, but we believe we will have plenty of chances in the coming months if concessions remain attractive. Ideally, we would like to make 30‐35% of our purchases at attractive levels in the primary market.  The yield premium on BBB debt relative to treasuries which stood at 1.34% at the end of March 2018 down from over 2.75% at the beginning of 2016iii. At CAM we target a weighting of less than 30% for our allocation to the riskier portion of the investment grade universe, which is BBB rated credit. Our concern with the growth in this lower rated portion of the market is the question of what could happen when the current credit cycle runs its course. If we were to experience a shock to the credit markets or a recession, then there is a portion of the corporate bond universe that is rated low‐single‐A that would be at risk of falling to BBB, further increasing the weighting of the risker portion of the market. More than that, there is a risk that many companies, who are rated low‐BBB, or barely investment grade, would be in danger of falling to high yield. The risk profile of a credit that is investment grade versus high yield can be dramatically different over a longer time horizon. According to Moody’s Investors Service annual default study, the 10yr cumulative default rate for Baa rated credit is just under 4% but that cumulative default rate jumps to north of 16% for credits rated Ba (high yield). This is the type of default risk that our investors are simply not bargaining for when they choose to invest in a high quality investment grade rated portfolio that targets an average credit quality of A3/A‐. These are the type of risks that we attempt to mitigate through our bottom up research process and our focus on the higher quality segment of the investment grade credit market. In closing, we thank you for your business and your continued confidence in managing your portfolios. As the fourth quarter of 2017 came to a close, investment grade corporate bond spreads narrowed to the tightest levels of the year, and the lowest since 2007i. 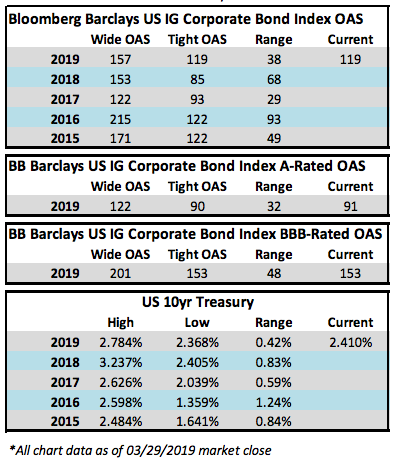 The Bloomberg Barclays US IG Corporate Bond Index OAS started the year at 1.22% and finished at 0.93%, which means that, on balance, credit spreads for the index tightened 29 basis points throughout 2017. During 2017, BBB credit spreads tightened more than single‐A spreads by 8 basis points. BBB spreads tightened 36 basis points in 2017, after starting the year at 1.60% and finishing at 1.24%, while A‐rated spreads tightened 28 basis points after starting the year at 1.01% and finishing at 0.73%. At CAM, our market reconnaissance, observance and experience told us that the insatiable demand for yield and income by both foreign and domestic investors drove the 2017 outperformance of lower quality investment grade credit relative to higher quality investment grade credit. Additionally, the composition of the investment grade universe has changed since the financial crisis ‐‐ in 2007, less than 35% of the Bloomberg Barclays US Corporate Index was BBB‐rated, while today nearly 50% of said index is BBB‐rated. At CAM, we believe that now, more than ever, it is prudent for us to populate our portfolios with credits that we believe have the durability and financial strength to make it through a downturn in the credit markets. We continue to limit our exposure to BBB‐rated credits at 30%, a significant underweight relative to an IG universe where nearly 50% of credits are BBB‐rated. We are focusing on sectors that we believe will behave more defensively if the credit cycle turns, or if spreads go wider. For example, we would rather forego a modest amount of yield and purchase a single‐A rated regulated utility operating company as opposed to a single‐A industrial with cyclical end markets. We continue to take appropriate risks within the BBB‐rated portion of our portfolios, but only if the individual credit is trading at a level that provides appropriate compensation for the risks. We intend to maintain a significant relative overweight to EETC airline bonds, which are highly rated bonds that are fully secured and offer excess compensation relative to what we are finding elsewhere in the market. As always, we are diligent in screening for and avoiding credits that are at risk for shareholder activism, as we attempt to steer clear of situations where shareholders are rewarded at the expense of bondholders. Simply put, we are loath to change our conservative philosophy against the backdrop of exuberant credit markets. The principal decision makers on our investment grade team measure their experience in decades, not years, so we have seen the cycles come and go. Thus, we believe skepticism and caution are the prudent courses of action, and our portfolios will be positioned accordingly. We believe our core differentiator is our credit research and bottom up process that allows us to populate our portfolios with individual credits with a goal of achieving superior risk adjusted returns over the longer term. The passage of a sweeping tax bill has generated some inquiry from our clients who would like to know what impact tax reform may have on the credit markets in 2018 and beyond. For investment grade corporate credit, we believe the impact will be relatively muted. There are two issues that could affect credit markets, interest deductibility and repatriation. Interest paid on debt is tax deductible, so as the corporate tax rate is lowered from 35% to 21% it makes debt issuance somewhat less attractive due to a lower overall tax burden. As far as repatriation is concerned, the repatriation tax rate on liquid assets held offshore will fall from 35% to 15.5%, so it is likely that some companies will bring some offshore cash back to the U.S. but we expect only a modest impact on investment grade credit. Of the $1.4 trillion that is held offshore by non‐financial U.S. companies, over 42% of that cash is controlled by just 5 large technology companiesii. While some companies will repatriate cash to pay down debt or to avoid taking on more debt, there will be others that repatriate cash for shareholder rewards and for M&A. Overall, we believe that tax reform will have a very modest impact on investment grade credit and that effect is most likely to be felt in 2018 investment grade new issuance. 2017 was a robust year for corporate bond issuance, with $1.327 trillion in gross issuance, 1% less than the amount of issuance that came to market in 2016iii. Even if tax reform does incent some companies to issue fewer bonds, the M&A pipeline remains robust with pending deals and potential deals, so we at CAM are expecting an issuance figure similar to the last two calendar years. 2018 should be another interesting year at the Federal Reserve. Jerome Powell will be the next Chair of the Federal Reserve, pending a confirmation vote by the full Senate. There is some belief that the Fed may turn more hawkish in 2018, as inflation is slowly creeping back into the picture and the labor market is showing signs of tightening, though wage growth remains relatively subduediv. The Fed continues to target three rate hikes in 2018, but what does this mean for the corporate bond market?v Though the first Fed rate hike of the current cycle occurred in December of 2015, the impact on the 10yr treasury has been relatively muted compared to the front end of the yield curve. In 2017 we experienced a flattening of the treasury curve. The 5/10 treasury curve started the year at a spread of 51 basis points and ended 2017 at 20 basis points. 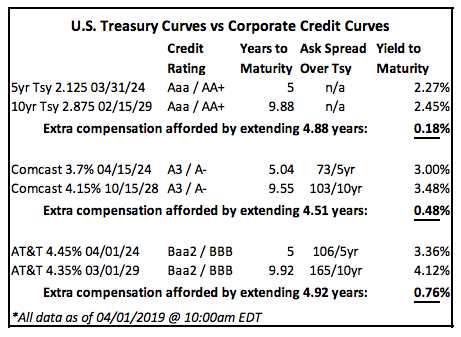 It is important to note that, even if the treasury curve were to flatten completely, or even invert, there would still be a corporate credit curve that would afford extra compensation to investors for owning 10yr corporate bonds in lieu of 5yr corporate bonds. Corporate bond investors are compensated for two risks; interest rate risk and credit risk. In our experience, investors spend a large portion of their time focusing on the risk they can’t control ‐ interest rate risk, and very little time on the risk that can be controlled – credit risk. We as a manager believe that we can provide the most value in terms of assessing credit risk. In our view, the key to earning a positive return over the long‐term is not dependent on the path of interest rates but a function of: (1) time (a horizon of at least 5 years), (2) an upward sloping yield curve (not only the treasury curve but also the credit curve) ‐ to roll down the yield curve, and (3) avoiding credit events that result in permanent impairment of capital. Understanding and assessing credit risk is at the core of what Cincinnati Asset Management has provided their clients for nearly 29 years. prevailing interest rates. When rates rise the value generally declines. Past performance is not a guarantee of future results. Gross of advisory fee performance does not reflect the deduction of investment advisory fees. Our advisory fees are disclosed in Form ADV Part 2A. Accounts managed through brokerage firm programs usually will include additional fees. Returns are calculated monthly in U.S. dollars and include reinvestment of dividends and interest. The index is unmanaged and does not take into account fees, expenses, and transaction costs. It is shown for comparative purposes and is based on information generally available to the public from sources believed to be reliable. No representation is made to its accuracy or completeness. The third quarter of 2017 was a reprise of what we experienced in the first two quarters of the year investment grade corporate bond yields were lower and credit spreads were tighter. As far as fundamentals are concerned, the majority of investment grade corporate issuers are displaying earnings growth and balance sheets are generally in good health. Demand for investment grade bonds has been robust in 2017, and issuers have responded in kind by issuing $1.06 trillion in new investment grade corporate bonds, though this pace of issuance trailed 2016 by 5%. During the quarter, the A Rated corporate credit spread tightened from 0.88% to 0.80% (down 8bps), the BBB rated corporate credit spread tightened from 1.41% to 1.31% (down 10bps) and the Bloomberg Barclays US Investment Grade Corporate Index credit spread tightened from 1.09% to 1.01% (down 8bps)ii. To provide some context, the all‐time tight for the Bloomberg Barclays US IG Corporate Index is 0.54%, last seen in March of 1997, while the all‐ time wide is 5.55%, last seen in December of 2008. As you can see from the chart above, credit spreads are near multi‐year lows. During times like these, when spreads have continued to move tighter, our experience shows that our client portfolios are best served by investing in high quality companies with durable earnings and free cash flow. In other words, we would rather forgo the extra compensation afforded from a lower quality credit and instead focus on investing in a stable to improving credit. Preservation of capital is a key tenet of our strategy, and we do not feel that the current level of credit spreads is providing adequate compensation for the riskier portions of the investment grade corporate bond market. At CAM, we focus on bottom up research through the fundamental analysis of individual companies and we do continue to see pockets of value in the investment grade market, particularly in the higher quality portions of the market. While credit spreads tightened during the quarter, the movement in Treasury yields was modestly higher as the 10 Year Treasury yield began the quarter at 2.31% and ended it at 2.33% (up 2bps). The 10 Year Treasury started the year at a yield of 2.45%, so while short term rates have increased as the Fed has implemented two rate increases so far in 2017 (i.e. the 2 Year Treasury ended the quarter 27 basis points higher from where it started the year), intermediate Treasury yields remain lower on the year. When short term rates increase and intermediate/long term rates stay stable or decrease, we refer to this as a flattening of the yield curve. This continuation of lower intermediate Treasury yields and tighter credit spreads resulted in lower corporate bond yields at the end of the quarter, relative to where yields started the year. The Bloomberg Barclays US Investment Grade Corporate Index returned +1.34% for the quarter, outperforming the Bloomberg Barclays US Treasury 5‐10 year index return of +0.46%iii. The CAM Investment Grade Corporate Bond composite provided a gross total return of +1.23% for the quarter which slightly underperformed the Investment Grade Corporate index but outperformed the US Treasury index. New issuance in the quarter saw issuers price nearly $350 billion in new investment grade corporate bonds, bringing the YTD total to $1.06 trillioniv. We have now eclipsed the $1 trillion mark for the sixth straight year, which speaks to the persistent, global demand from investors searching for yield and income for their portfolios. With low‐ to‐negative yields in global fixed income securities, the US Investment Grade corporate bond market still provides a good alternative for global investors (see chart)v.
The Federal Open Market Committee (FOMC) opted not to raise rates at its September meeting, with the market focused squarely on the December meeting. During its September meeting, the FOMC did provide the long awaited details on its program to gradually reduce the size of its balance sheet. The FED is merely reducing the reinvestment of principal payments from the Federal Reserve’s securities; it is not actively selling its holdings. The FOMC has provided a roadmap of its policy normalization efforts along with a schedule of how it plans to gradually reduce its balance sheet over time (see chart)vi. Like most policy actions, the FOMC has showing a willingness to be flexible, pending new information and economic data, so time will tell if the securities reduction schedule is actually implemented as planned. While the FOMC has begun a gradual effort to tighten monetary policy, the ECB too has discussed scaling back its monetary easing as soon as January 2018, but the plan is vague at this point and the world will be watching closely for more details when they meet again near the end of October. Meanwhile, the BOJ recently pushed back the window for achieving its 2% inflation target for the sixth time; to around fiscal year 2019, meaning the bank will not embark on policy tightening in the near termvii. Bottom line, we are only in the very early innings of a more concerted effort to tighten monetary policy by global central bankers. credit spreads or interest rates is difficult, if not impossible to predict, it is important to understand the impact that higher yields would have on the corporate bond market especially as it relates to a corporation’s balance sheet, cash flows and credit quality. Corporate bond investors are compensated for two risks; interest rate risk and credit risk. In our experience, investors spend a large portion of their time focusing on the risk they can’t control ‐ interest rate risk, and very little time on the risk that can be controlled – credit risk. We as a manager believe that we can provide the most value in terms of assessing credit risk. In our view, the key to earning a positive return over the long‐term is not dependent on the path of interest rates but a function of: (1) time (a horizon of at least 5 years), (2) an upward sloping yield curve (not only the treasury curve but also the credit curve) ‐ to roll down the yield curve, and (3) avoiding credit events that result in permanent impairment of capital. Understanding and assessing credit risk is at the core of what Cincinnati Asset Management has provided their clients for nearly 28 years. The second quarter of 2017 saw a continuation of the prevailing trend of tighter credit spreads across the US corporate bond market. This trend of tighter spreads, which has been unabated for nearly 16 months, has been a significant contributing factor to the overall positive performance of the Investment Grade corporate bond market during that time frame. Specifically, during the quarter the A Rated Corporate credit spread tightened from 0.97% to 0.88% (down 9bps), the BBB Rated Corporate credit spread tightened from 1.51% to 1.41% (down 10bps) and the Bloomberg Barclays US Investment Grade Corporate Index credit spread tightened from 1.18% to 1.09% (down 9bps)i. Along with this credit spread tightening the movement in Treasury yields were generally lower as the as the 10 Year Treasury yield began the quarter at 2.39% and ended it at 2.31% (down 8bps). This continuation of lower treasury yields and tighter credit spreads have seen the overall yields of corporate bonds end the first half of the year lower than where they started the year. While both US Treasuries and Investment Grade corporate bonds both ended the quarter with lower yields, thus both achieving positive performance, Investment Grade corporate bonds outperformed Treasuries due to the tightening of credit spreads and higher coupon income collected. The Bloomberg Barclays US Investment Grade Corporate Index returned +2.54% for the quarter, outperforming the Bloomberg Barclays US Treasury 5‐10 year index return of +1.24%ii. The CAM Investment Grade Corporate Bond composite provided a gross total return of +2.08% which slightly underperformed the Investment Grade index but outperformed the US Treasury index. New issuance in the quarter was a robust $344 billion in new Investment Grade corporate bonds, yet slowing down from the record pace in the first quarter, bringing the YTD total to $760 billion iii. We are well on our way to the sixth straight year of over $1 trillion in new issuance, which speaks to the persistent, global demand from investors searching for yield and income for their portfolios. This demand is partially driven by the fact there still exists $6.5 trillion of negative yielding securities in the Bloomberg Barclays Global benchmark index, a sum that has shrunk from a peak of $12 trillion in June 2016 (see chart)iv. With low‐to‐negative yields in global fixed income securities, the US Investment Grade corporate bond market still provides a good alternative for global investors. The Federal Open Market Committee (FOMC) acted again during the quarter by boosting the target range for the Federal Funds rate by another 25bps at their June 14th meeting v. At the time of the FOMC action the 10yr US Treasury yield was 2.17% and the move up in short term rates influenced by the policy move has flattened the yield curve even further, something we discussed extensively in our Q1 2017 commentary. (A copy of that and all of our previous commentaries can be found on our website at www.cambonds.com.) Central Banks around the world have been hinting at ending their ultra‐ loose monetary policy and begin to wind down their active quantitative easing (QE) programs vi. While the FOMC has not been actively adding to its balance sheet via QE, it has been maintaining it around $4.5 trillion by reinvesting proceeds from maturing bonds in its portfolio. Members of the Federal Reserve board, including Janet Yellen, have openly discussed starting to unwind its $4.5 trillion balance sheet sometime this fall by letting some of its maturing securities run off and not be reinvested. However, as of yet, no set timetable has been established vii. As with most FOMC policy shifts, investors are best served to watch what the FOMC does and not what they say as they make these changes. The unwinding of trillions of dollars of securities will be difficult to execute, and will be closely watched by investors around the world. While the FOMC is looking to reduce the size of its balance sheet, the European Central Bank and Bank of Japan have been significantly adding to theirs over the past several years with both recently surpassing the size of the balance sheet of the Federal Reserve (see graph)viii. While neither of the two have definitive plans to end QE it would seem that halting open market purchases would be the first step in the direction of policy normalization. With potentially significant central bank policy shifts on the horizon US Investment Grade corporate bond markets have exhibited a strange sense of calm in the first half of 2017. This could be attributable to the lack of volatility exhibited across nearly all asset classes along with the prevailing market perception that nearly any disruption in credit markets would be met with a large dose of liquidity from the Federal Reserve. While the Fed is close to meeting its unemployment mandate, it is failing to meet its desired inflation mandate. This is giving the market the sense that the Fed will feel that it has the flexibility to deliver more liquidity into the market if deemed necessary. With the persistent tightening of credit spreads and decline in overall interest rates, performance has been stable, consistent and fairly robust. With yields and credit spreads below their long term averages investors should not grow too complacent to think these trends will continue in perpetuity. A change in QE policy by global central banks or deterioration in credit conditions due to the onset of recession may alter the path of both interest rates and credit spreads rather quickly. While we are not predicting the imminent commencement of either of these events, investors should be prepared for potential volatility in corporate bonds that a reversion to the long term mean in rates and credit spreads would bring about. This volatility may not come for some time, but it is something to consider when thinking about expectations for the asset class. While this may, or may not, occur during the timeframe of anyone’s investment horizon, when it does, it will be imperative to understand the impact higher yields will have on the corporate bond market especially as it relates to a corporation’s balance sheet, cash flows and credit quality. Corporate bond investors are compensated for two risks; interest rate risk and credit risk. In our experience, investors spend a large portion of their time focusing on the risk they can’t control ‐ interest rate risk, and very little time on the risk that can be controlled – credit risk. We as a manager believe that we can provide the most value in terms of assessing credit risk. In our view, the key to earning a positive return over the long‐term is not dependent on the path of interest rates but a function of: (1) time (a horizon of at least 5 years), (2) an upward sloping yield curve (not only the treasury curve but also the credit curve) ‐ to roll down the yield curve, and (3) avoiding credit events that result in permanent impairment of capital. Understanding and assessing credit risk is at the core of what Cincinnati Asset Management has provided their clients for nearly 28 years. After a very volatile end to the year in 2016, the first quarter of 2017 saw a much more benign movement in interest rates and corporate bond yields as most fixed income markets stabilized after a difficult fourth quarter. During the first quarter of 2017, Treasury yields traded within a fairly narrow, 24 bps range. The movements in Treasury yields were generally lower as the 10 Year Treasury yield began the quarter at 2.45% and ended it at 2.39%. Accompanying the lower yields in Treasuries, corporate credit spreads continued their persistent grind tighter that began in mid‐ February of 2016 and ended the quarter near the tightest levels of the past 13 months. Specifically, the A Rated Corporate credit spread tightened from 1.01% to 0.97% (down 4 basis points (bps)) and the BBB Rated Corporate credit spread tightened from 1.60% to 1.51% (down 9bps)i. When looking at the movement of interest rates and credit spreads together, the decline in Treasury yields and slightly tighter corporate credit spreads helped Investment Grade corporate bond yields end the quarter slightly lower than where they started. While both US Treasuries and Investment Grade corporate bonds both ended the quarter with lower yields, thus both achieving positive performance, Investment Grade corporate bonds outperformed Treasuries due to the tightening of credit spreads and higher coupon income collected. The Barclays US Investment Grade Corporate Index returned +1.22% for the quarter, outperforming the Barclays US Treasury 5‐10 year index return of +0.89%ii. The CAM Investment Grade Corporate Bond composite provided a gross total return of +1.37% which outperformed both of the above mentioned indices. The beginning of the year saw robust demand for US Investment Grade corporate bonds which allowed for a record setting new issuance in the quarter. During the quarter there was $413B of new issuance across 565 issues which represented a 14% increase from Q1 2016iii. A large portion of the new issuance were bonds with 5 and 10 year maturities ‐ an area of interest for CAM. As an institutional investor who participates in the primary (new issuance) marketplace, we were able to be fairly active in Q1, which has benefits to our clients. According to CreditSights, the average yield pickup in the new issue market for 10yr Investment Grade Corporate Bonds in the first quarter was 10bps, or 0.10% in additional yield, versus comparable bonds of the same issuer in the secondary marketiv. We will continue to participate in the primary market when there are attractive opportunities in credits we like. The first quarter was also marked by policy action by the Federal Open Market Committee (FOMC) at their March meeting. While CAM has always considered itself interest rate agnostic in its investment process, we think it makes sense to clarify what the FOMC has been doing and its effects on the yield curve as it relates to our portfolios. The FOMC sets interest rate policy for very short‐term interest rates by influencing the Federal Funds rate, the overnight lending rate between banks. One way this is done is through adjusting the reserve requirements of member banks with The Federal Reserve. The FOMC sets a target rate that is, effectively, what most think of when one hears that the Fed “raised rates” or “lowered rates”. This in no way directly affects interest rates for other, longer dated maturity bonds. Those interest rates are determined by investors’ inflation forecasts, which can be impacted by FOMC activities. So, interest rate policy indirectly affects yields on longer dated fixed income securities. It may be surprising what this impact has been since the FOMC has been hiking the target Federal Funds rate in this cycle. As an investor in the intermediate portion of the yield curve (5 – 10 year maturities), we will examine the 10 year part of the Treasury curve to analyze those interest rate movements around the recent FOMC policy actions. The FOMC began their recent increase in monetary policy on December 16, 2015 by hiking the Federal Funds target rate by 25 bps or 0.25%v. This was their first “rate hike” in over a decade. The day they made this policy announcement the yield on the 10yr US Treasury was 2.30% (see graph)vi. The immediate effect on this yield was opposite of what most market commentators and investors thought as it began a sharp decline all the way to a low of 1.37% on July 5, 2016. The next FOMC policy action came a year later on 12/14/16 when they announced a hike in the target rate by another 25bpsvii. At the time of this announcement the yield on the 10yr US Treasury was back up to 2.54%. The reaction to this policy move was again a decline in yield to a low on 2/24/17 of 2.31%. The FOMC’s most recent move, their third “rate hike” of 25bps saw the 10yr US Treasury yield at 2.51% which has since declined to 2.18% (as of 4/18/17)viii. In summary, since the FOMC began moving up their target range on the Federal Funds rate in December 2015 by a total of 75bps or 0.75%, the yield on the 10yr US Treasury has moved down from 2.30% to 2.18% with more downside volatility in between. We are not suggesting that this pattern will continue or that it is indicative of any future direction of interest rates. In fact if the FOMC were to begin unwinding their $4.5trillion balance sheet, as has been recently discussed by Janet Yellenix, they may directly affect this part of the yield curve by selling treasury and mortgage securities in the open market. Prior unconventional FOMC actions of quantitative easing (QE) directly affected longer term interest rates by lowering them through open market purchases of treasuries and mortgages. If any future unconventional FOMC policies were to unfold we will address those issues in future quarterly commentary or white papers available at www.cambonds.com. The point is that while investors are sometimes focused on the short term noise of the FOMC policy actions, the long term outcome can be different from what one expects. In addition to this decline in yields on 10yr US Treasuries, credit spreads have tightened considerably during this time, giving a boost to the performance of US Investment Grade Corporate Bonds. During this period of FOMC policy action of “rate hikes” the total return of US Investment Grade Corporate Bonds as measured by the Barclays IG Corporate Bond index has been in excess of +7.0%x. Clearly this type of return was not expected by many when the FOMC embarked on this “rate hike” cycle, and should not be expected to continue in the future, but has rewarded those investors who stayed the course and were not led to exit corporate bonds because the FOMC was “raising rates”. is not dependent on the path of interest rates but a function of: (1) time (a horizon of at least 5 years), (2) an upward sloping yield curve ‐ to roll down the yield curve, and (3) avoiding credit events that result in permanent impairment of capital. Following this philosophy over time can help investors to ignore the short term noise of any FOMC policy actions and focus on what is truly important. Corporate Bond investors are compensated for two risks; interest rate risk and credit risk. The first, interest rate risk, is approximated by US Treasury yields. The second, credit risk, is the remuneration for the business risk of the underlying company; this remuneration is expressed as the premium received in excess of the US Treasury yield. In our experience, investors spend a large portion of their time focusing on the risk they can’t control ‐ interest rate risk, and very little time on the risk that can be controlled – credit risk. We as a manager believe that we can provide the most value in terms of assessing credit risk. In our view, the key to earning a positive return over the long‐term is not dependent on the path of interest rates but a function of: (1) time (a horizon of at least 5 years), (2) an upward sloping yield curve ‐ to roll down the yield curve, and (3) avoiding credit events that result in permanent impairment of capital. The fourth quarter of 2016 saw a substantial increase in Treasury yields as they generally trended higher at the beginning of the quarter and moved sharply higher towards the end of the quarter. The movement higher in Treasury yields did not begin on November 8th (election day in the US) but accelerated at that point before peaking in mid ‐December. Offsetting the higher yields in Treasuries, corporate credit spreads continued their persistent tightening since the mid‐February widest levels of the year and ended near the tightest levels of the year. Specifically, the 10 Year Treasury began the quarter at 1.60%, peaked at 2.60% (up 100 bps) on December 15th and ended the quarter at 2.45% (up 85 bps). The A Rated Corporate credit spread tightened from 1.12% to 1.01% (down 11bps) and the BBB Rated Corporate credit spread tightened from 1.78% to 1.60% (down 18bps). When looking at movement of interest rates and credit spreads together, the sharp rise in Treasury yields was only partially offset by tighter credit spreads, thus yields for Investment Grade corporate bonds ended the quarter higher than where they started. While both US Treasuries and Investment Grade corporate bonds both ended the quarter with higher yields, Investment Grade corporate bonds outperformed by a considerable margin. Our Investment Grade Corporate Bond composite provided a gross total return of ‐3.62%, which trailed the Barclays US Investment Grade Corporate Index, but outperformed the comparable US Treasury index. For the quarter, our underperformance relative to the US Investment Grade corporate benchmark can be primarily attributed to our focus on the 5 – 10 year part of the credit curve, the much shorter end of the curve was less impacted by increasing rates, and our underweight to the BBB credit quality segment relative to the benchmark. Since our portfolios tend to hold fewer BBB rated bonds and more A & AA rated bonds, one can see how this influenced our performance relative to the benchmark. This contrasts with our 2015 outperformance of the benchmark (+1.01% vs ‐0.68%) which can be partially attributed for the exact opposite reason of widening credit spreads and our long time policy of limiting BBB rated bonds. As the year ended, we saw a continuation of many of the same themes we have written about in our previous commentaries. The continual tightening of credit spreads, which has provided better relative returns than US Treasuries, continued unabated since mid‐February. New corporate bond issuance set a new record in 2016 with nearly $1.3 Trillion of new Investment Grade issuance providing the supply to meet robust investor demand iii. Companies have been very eager and aggressive to issue bonds to lock in coupon rates near all‐ time historic lows (chart above). As we enter 2017 a great deal of concern and speculation has centered on the future direction of interest rates due to potential new policy actions by a new administration in Washington DC. We as a firm do not utilize interest rate anticipation or forecasting in our investment process thus, we do not have an official firm view on the direction of rates. We do understand the concern investors have with the uncertainty of the direction of interest rates, but it is a risk we have no control over. What we do have control over is the composition of a portfolio as it relates to the credit quality it exhibits and assessing the risks associated with each company’s capacity to pay its future interest payments and ultimately return of principal to investors. As an investment manager solely focused on assessing this credit risk, this is where believe we have the ability to add value to a fixed income portfolio where an allocation to US corporate credit has been made. It is important to note that credit spreads are at levels that are tighter than their 30 year average. There is risk of potential corporate bond volatility due to these credit spreads mean reverting, which is something investors should be aware of as we move forward. If this credit spread widening were to unfold, we believe a portfolio with a corporate bond manager like CAM that underweights the riskiest credit quality of Investment Grade bonds and focuses on understanding the credit risks of the companies it owns, should help alleviate some of the potential volatility relative to other Investment Grade fixed income sectors. It is important to note that higher Treasury yields have historically provided a buffer to adverse interest rate movements ‐‐with absolute yields at the lower end of long‐term ranges, small rate changes can have a larger impact on bond values as there is less cushion to absorb adverse outcomes. This information is intended solely to report on investment strategies identified by Cincinnati Asset Management. Opinions and estimates offered constitute our judgment and are subject to change without notice, as are statements of financial market trends, which are based on current market conditions. This material is not intended as an offer or solicitation to buy, hold or sell any financial instrument. Fixed income securities may be sensitive to prevailing interest rates. When rates rise the value generally declines. Past performance is not a guarantee of future results. Gross of advisory fee performance does not reflect the deduction of investment advisory fees. Our advisory fees are disclosed in Form ADV Part 2A. Accounts managed through brokerage firm programs usually will include additional fees. Returns are calculated monthly in U.S. dollars and include reinvestment of dividends and interest. The index is unmanaged and does not take into account fees, expenses, and transaction costs. It is shown for comparative purposes and is based on information generally available to the public from sources believed to be reliable. No representation is made to its accuracy or completeness.